Here we are in the last month of the year. Many of us will ignore the garden as holiday preparations take precedence. Others are looking forward to next year. Either way, there’s plenty to do in the garden to make the springtime garden more manageable. Here’s what I do in the December garden. At this time of year, we’re less inclined to go outside. Which is really too bad, because the fresh air and few minutes of movement can really benefit our health. Outside of that, spending just a few minutes tidying up now can mean the difference between “fun” and “overwhelming” when we begin preparing the spring garden. The tasks for this month are harvesting and preparing the garden for winter and spring. Note: I’m in USDA hardiness zone 6a, so your experience may differ from mine. What you can do this time of year will depend largely on your local weather and if the ground is still workable. Cut back dead plant matter. Trash it if it was diseased, otherwise compost it. I like to compost in place by chopping the organic matter into smaller pieces that will feed the soil life and break down easily. Leaving the roots intact will also feed the soil life. See my article Building the Right Compost Bin. Here are 5 weeds you want in your garden. Also see when weeds are good. Cover beds with a deep mulch. I like shredded leaf mulch because it’s free, but chemical-free straw is good, too. For more of my mulching tips, see Mulching in the Garden. Cover any vegetables with a cold frame or row cover. (This isn’t necessary for garlic). For more cold frame tips, see this article. If you plan to build new beds, now is a great time to do it. There will be so much to do in the spring, why not get this part done? Building them now will allow the soil to settle so the beds are ready to go in the spring. Of course, if the ground is frozen, it’s better to wait. Above is a picture of one of the raised beds we built on our driveway in December of 2010. It’s 24 inches high. We eventually built a second one to the right of it where the pallets are. When constructing a raised bed on an impervious surface, make the bed as tall as possible – roots will need all the room you can give them. We probably should have made this bed another 8-inches taller, although we haven’t seen any negative consequences in the plants. A deeper bed will also hold water longer, requiring less frequent irrigation. Fill the bottom 6-8 inches with gravel before filling it the rest of the way with soil. This will take A LOT of soil. The gravel will help with drainage and keep the soil from washing away in a heavy rain. We did some major composting in the summer leading up to this project and were able to supply all the soil this bed needed. Take note that the soil will settle, that’s why we built it in December. By springtime we added a bit more soil and were ready to plant. Here’s to a healthy and productive December garden! Are you preparing for spring or are you preparing for the holiday this time of year? So glad to find you. We aldo have 1/10 of an acre. This is great, I really need to stay on top of my garden, we have a break from the snow and I need to get out there and do some of this while I can. That sounds amazing! 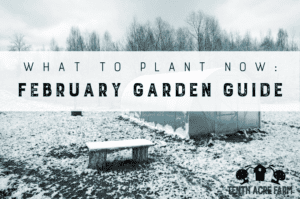 You’re going to have such a great spring garden! Oh what a good tip, Amy, to build raised beds now and add soil now so that you can add more in spring when it settles. I wouldn’t have ever thought of that. I have some beds that need to be built in our new greenhouse, maybe that’ll be just the motivation I needed! And it’ll definitely be good to get back outside. It is so sad to look out the window at the bright, beautiful sun and know that it’s actually freezing!! !